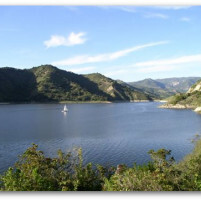 A 47-year-old Southern California man failed to make it to shore after his boat capsized at Lopez Lake on Thursday afternoon. The man drowned and was later found dead in the lake. Around 2:15 p.m., three people were sailing on a catamaran at the Cottonwood Cove area of Lopez Lake. The boat capsized, after which all three sailors tried to swim to shore. Two succeeded, but the 47-year-old man did not. He was not wearing a life jacket, according to the San Luis Obispo County Sheriff’s Office. Deputies and the sheriff’s underwater search and dive team came out to the lake after receiving a call about a possible drowning. The dive team did not locate the victim’s body until about 6:30 p.m.
Investigators do not suspect any foul play, but an investigation is ongoing. Authorities are withholding the victim’s identity as they contact his family.